This is a guest post by Sigrun Tallungs (@tallungs). The original was written in Swedish and published on this blog earlier. 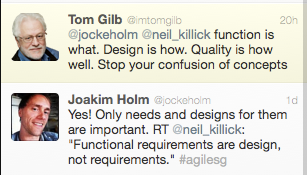 That post, in turn, was a response to my post on Modern Agile. What I like about Modern Agile is that it shines a light on what really hurts today, beyond the traditional focus on pumping out software features. Modern Agile aims to understand how we create value. Here’s how: Someone has to love what we create (”Make people awesome”). And for us to succeed we need to feel safe and reduce the risks involved (”Make safety a prerequisite”). Since we cannot figure out in advance what people really need, the way to go is to carry out a great number of experiments. That’s is basically all Modern Agile is – but that’s a lot! Since its birth, the agile movement has engaged software developers but relatively few others. To face the challenges of today we need to involve all parties in the business surrounding the service or service eco-system we are developing. It is the co-operation of all these people that needs to be agile. Organizing work around projects does not fit any form of work that is creative, open-ended, and patterns-based, relying on human ingenuity and judgement to create value. This is most notable in research, creative jobs, and development in all its forms; be it organizational change, personal growth or software development. I work as a software consultant and often in the role of a so-called “team coach” or “agile coach”. That’s basically just a hyped-up term for helping teams and departments to improve, to be more effective, and guide them on their way amongst a myriad of options. So coaching is great and many coaches I know are great, but there’s something bothering me. My opinion is that much of what I do is a kind of management – not of the people but of the work, and I’m getting more and more concerned about this. Should this really be the coach’s job? When Ian told them what he’d done, they couldn’t believe their ears. He had what!? He had erased every document in the company database concerning hiring and retaining staff. Joan’s deep thoughts on “talent management” simply gone. Gone! “Hey, what about the backups?”, Helen asked. Ian just smiled, “Those too”.